We have various New replacement parts for Pioneer and Sansui, and Salvage Parts Units, including Parts for many Brands of Classic Stereo Electronics. Our Selection is constantly changing, so check here for those hard to find parts. Please feel free to email us about specific parts needs, and also use our Free Forum and Free Classified Ads sections to post your requests and to sell your salvage and new electronics parts and units. Thank you for using CBSMart.com! THESE SWITCH REPLACEMENTS HAVE BEEN DISCONTINUED! If the locking push switch on your RG-2, RG-9, RG-60, SG-300, SG-540, SG-550, SG-9800, SR-9, SR-60, SR-303, and other Pioneer EQ's, Reverbs, Dynamic Processors is not staying in then Here's the fix for you. May also fit other units. 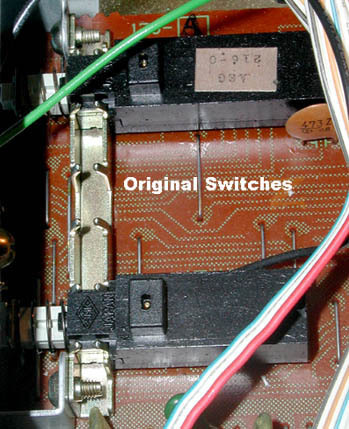 The original switches had almost a 100% failure rate! 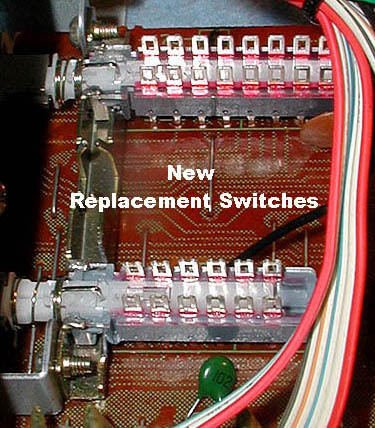 These switches will replace Tape Monitor, Attenuator, Processor and other push-in / locking switches on vintage Pioneer Gear. We have both 12-Pin (4-pole, 6 pins per side) and 18-pin (6-pole, 9 pins per side) switches. They are a simple install for most electronic techs. Electronic equipment carries dangerous and potentially lethal electrical currents. proper knowledge of electronics and the hazards of electricity! knowledge of electronics and the hazards of electricity! These are Extremely hard to find replacement output transistors for The Monster Sansui QRX 8001 Quad Stereo receiver. They are correct number match components, not cross reference, and are in two configurations for each channel. The two models are '2 SD 673 -0425', and '2 SB 653 - 0424' they are sold only in pairs.